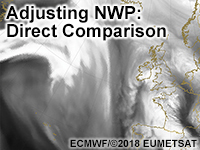 If there were a way to make direct comparisons between satellite imagery and NWP output, that would appear to be the best possible way to find mismatches between the observed weather and NWP output. In this lesson, we'll address possible methods for making direct comparisons, starting with pseudo or synthetic satellite imagery and building to a point where we focus on a relatively unused NWP output. This is the third in a series of video lessons that introduces three different methods for modifying NWP output to add human value to forecasts. Assess relevant NWP output compared to observed satellite imagery.